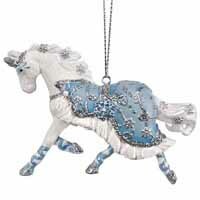 Winter Ballet | Pony Ornaments Figurines | One Price Low Flat Shipping! 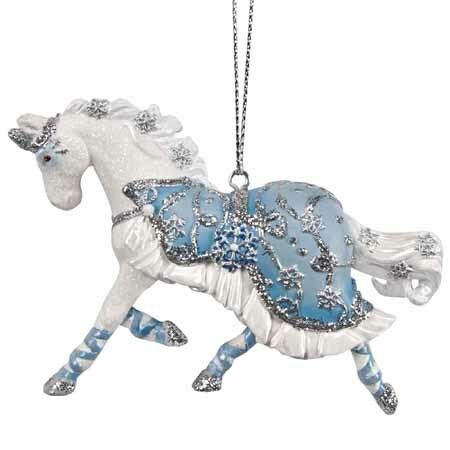 From the Trail of Painted Ponies 2017 Holiday Ornaments Collection, Winter Ballet 2.5" Hanging Christmas Ornament. Designed by artist, Bryn Wilkins Lawson. Made of stone resin. Measures 2.5" tall. Comes with hanging cord attached and packaged in collectible gift box. The inspiration for this original design comes from a Holiday ballet the artist attended with her daughter. Dashing through the snow in a magical cape that is made to fit similar to a real horse blanket, but with ruffling added at the bottom to convey the subtle idea of a ballet tutu, “Winter Ballet” has an icy feel to it, thanks to decorative snowflake details worked into the body and base, and shimmering in the mane and tail. She, of course, is wearing a crown shaped to represent half a snowflake.